Read this blog for a nightly recap of Fire in the Triad posts to stay in the loop. You can also follow me on twitter @niksnacks and the hashtag #CompDiningNC for live updates during each battle (The next dinner begins June 26 at 7pm). Please also point your web browsers to competitiondining.com OR "like" Competition Dining on Facebook! Subscribe to Nik Snacks' email list to be sure to get all of the news that's fit to eat. Two chefs were in the running for the second spot in the Fire in the Triad finals. Only one can win and get that coveted red chef's jacket. And $2,000. And a custom set of hand-forged knives from Ironman Forge. And prestige. And bragging rights. And... the list could go on. Meet two of the Final Four: Chef Timothy Bocholis of Bistro B in Kernersville and Chef Creighton McNeil of Liberty Oak in Greensboro. They've been here twice before, and as everyone knows: the third time's the charm. Personally, I am HUGE fan of Texas Pete. It is my hot sauce of choice and I put it on nearly everything when it's offered at fine dining establishments around the South. Thanks to Texas Pete, I will never be without my favorite condiment. Some people carry gum. 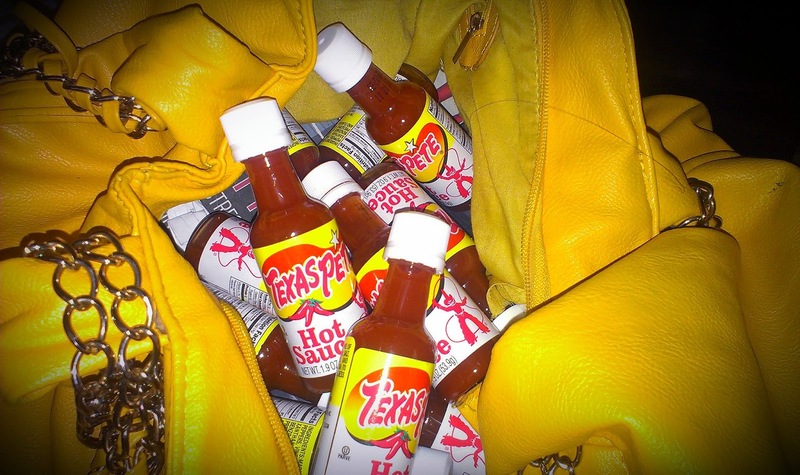 I carry Texas Pete. Everyone dining on Wednesday night receive a small token of appreciation. I took more than one. Texas Pete enhances the food its sprinkled on. It's more flavorful than spicy, and it adds another layer of flavor when used. Whereas Tabasco simply adds heat, Texas Pete raises the hot sauce bar and makes simple food complex. All of this, of course, is my personal opinion. Other Texas Pete enthusiasts and judges for the evening: John Batchelor, food critic for Greensboro News & Record, David Bailey of O. Henry magazine and fellow blogger, Cecilia Thompson of Mod Meals on Mendenhall. Very similar to a second course dish done during last year's competition, I had a clue as to which team produced this first course when it arrived to the table. It was the exact same plating and flavor profile. To last year's replicated salad I said the dish was "inspired, light, refreshing" and this salad was as well. I had a few big, juicy pieces of lobster which made the dish luxe, but the star of the dish was the crab chimichurri. The crab had the faint aftertaste of seafood from a can, but the Texas Pete masked it pretty well. I appreciated the lettuce leaf separating the lobster from the crab so the flavors of the two components did not mix until I was ready for them to. The guava sorbet was well prepared: smooth, sweet and fruity, it acted as a coolant to the hot sauce. The unlisted garnish of sweet potato chip was just like last year's dish too. It was burnt then and it was burnt last night, too. As I explained to my table (and I will explain to you), Nigiri is a type of sushi. There are two types: maki, which is the rolled kind that we are used to and nigiri-- hand-rolled ball of rice with sliced raw fish with on top. The design is meant to simulate a swimming fish. The wonton cup was definitely crispy and I expected it to be sodden with the addition of the gastrique. The wonton a fresh melange of lobster, shrimp and the small ball of rice. My rice was chilled, but a little mushy. I did not get much lobster in my portion, but the shrimp I got were good and peppered with fresh chopped parsley, a little cilantro and diced jalapeno. The miniscule drizzle of gastrique was definitely vinegary and sweet, VERY sweet, but I did not detect much Texas Pete flavor or any spice. At first, the description of this dish threw me off. It looked like beef, smelled like beef and tasted like beef, what was the deal? Mock beef was a terrible description. I thought I was being punked with tofu. But Jimmy Crippen explained," This cut of beef is from the teres major region..."
I remember from culinary school, that is the blade of the cow's shoulder. It is known as bistro filet or petite medallion. After that verification, I now can confidently report that it was some of the best beef I've ever tasted. My portion was juicy, soft, easy to cut into with a butter knife and cooked to a perfect medium rare. On a scale of 1 to 10, the Texas Pete flavor was a 2. I had my little tableside mini bottle, and I was tempted to pour it on, but I decided to soldier on and taste the flavors of the other dish components. The potatoes were smoky, the roasted bit of fennel was mellow, sweet and woodsy. The summer salad consisted of lettuce, squash, mushrooms, asparagus and green beans (or haricot verts, because they were very thin and French, of course). All of the greenery was crisp, crunchy and just barely cooked. Yeahhh, buddy! My personal favorite dish of the night, this was one of the higher scoring courses. This was creative, unexpected and very delicious, through and through. The chili had beans in it, black beans, that were undercooked and toothsome. They weren't unpleasant to eat, but I missed the soft mouthfeel of fully-cooked beans. Bits of elk, onion, and bell peppers were swimming in the Texas Pete-spiked soup. Sitting on top: thinly sliced rare elk that melted into the dish. The orange honey butter was great smeared on my cheddar fried cornbread. It was a little gloppy and not incorporated well. It didn't really go with the flavors of the chili, but it made me love the cornbread more. Ohhhh, the cornbread! Cheesy, crunchy, golden, buttery and delicious, it was right on time. It was a big ol' hushpuppy, happy to soak up all of the residual juice and soup of the chili. To quote Jimmy Crippen,"We started with elk and now we're having mousse [moose]." "Mousse" is a term I'd use lightly to describe this course. I'd classify this as a "cremeux"[creme-OH]. A cremeux is French for "creamy". A chocolate cremeux is not fudge or a sauce nor is it a mousse, but it's sort of in between. Not the prettiest dish of the night nor the most aromatic, looking at it was reminiscent of the after effects of eating. Aroma is one of the voting categories and this dish did not score high with me in the aroma department. It smelled of uncooked eggs. No chocolate or Texas Pete wafted in the air. I wished there was more orange in the cremeux mousse, as it was flavored very lightly with the citrus. 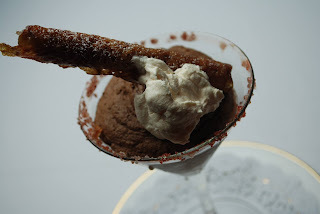 The salted rim of the glass added the perfect contrast to the rich chocolate taste. The Texas Pete in the Chantilly cream was very light and I wished there was more. Again, the salty savor of the cream matched with the chocolate. The lowest-scoring dish of the night, I could not have agreed more. Whereas the last dish was not, this course WAS, a mousse. I couldn't taste any Texas Pete, but I did get the saltiness of the hot sauce in the chocolate. The cheesecake did not set up properly and it was mushy and smelled of uncooked eggs, too. My first bite had a chocolate chip in it and that was the best part. It was creamy, tangy and chocolaty, but more of those chocolate chips would have made the cake taste better. The cherry ice cream had flavorful bits of cherry but it was very grainy and over-churned. The salted caramel was the best part of this course and I wished it had been spiked with Texas Pete to bring some sass and creativity to the plate. The execution of this dish was lacking and was a weak bookend to an otherwise good dinner. Before the last course's scores were tallied, there was only one point difference between the chefs. Desserts make or break you in this competition and Wednesday night was no exception. 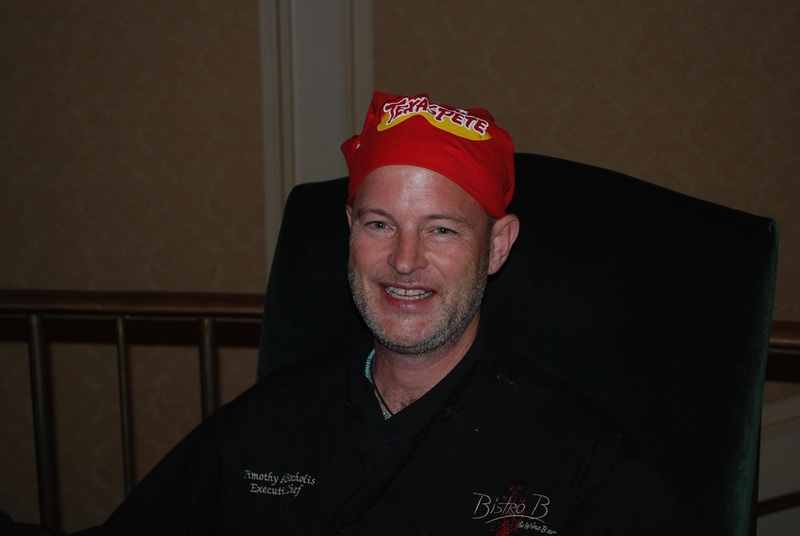 The tabulation of votes revealed Chef Timothy Andrew Bocholis of Bistro B as the winner of battle Texas Pete! I think he's a Texas Pete fan! Chef Bocholis and Chef Bobby of Noble's Grille will meet in the Fire in the Triad finals Wednesday, June 26 at the Empire Room in Downtown Greensboro. The event is sold out, but you can still follow the action via Twitter, Facebook and Competition Dining. I am getting hungry just reading this! I love Texas Petes too...making a buffalo wing dip with it for a pool party Monday!! But I think after reading this I may need to try it for other things too!! Following now! Thanks for your follow, Michelle! I hope your dip turned out spicy & delicious!